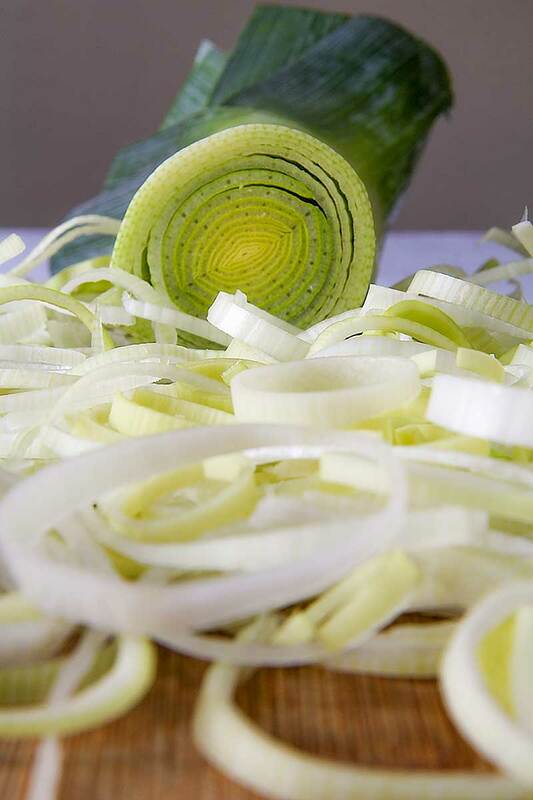 Slice the white part of 1 leek, then, melt the butter into a bottom thickened pot over low heat. When the butter is completely melted, sauté the leek combined with turmeric powder until extremely soft. Meanwhile Peel and dice coarsely the potatoes. 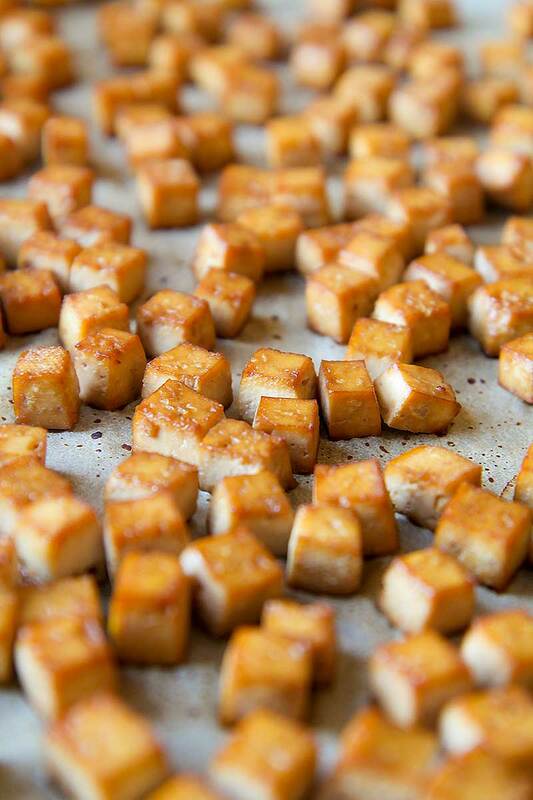 Now, cut the tofu into dices large 1/4 inch, and marinate them 30 mins into the soy sauce. 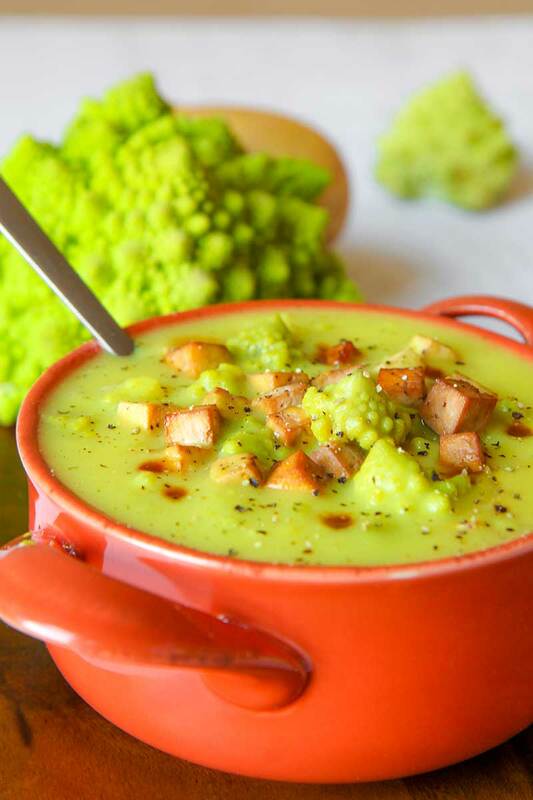 Finally, divide the Romanesco broccoli into little stems. When the leek is soft and translucent, add the potatoes, raise the flame at medium and stir fry 5 minutes. Now add hot water just to cover the potatoes. Cook 25-30 mins, until potatoes are well cooked. Meanwhile the potatoes are cooking, place the tofu dices over a dripping pan lined with parchment paper, and bake 10 minute. Finally, broil until tofu will be golden and crispy. 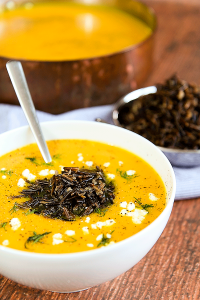 When the potatoes are well cooked, add the coconut milk and blend with a mixer to obtain a consistent cream. Now, pour again the potatoes cream into the pot, bring it to simmer and add the romanesco stems. Add salt as needed and cook until the stems are well cooked, but still crunchy. Finally add the tofu and pour the coconut cream soup in the bowls. Decorate with black pepper and a few drops of soy sauce. Serve hot, but not to much! Slice the white part of 1 leek, then, melt the butter into a bottom thickened pot over low heat. When the butter is completely melted, sauté the leek combined with turmeric powder until extremely soft. Meanwhile Peel and dice coarsely the potatoes. 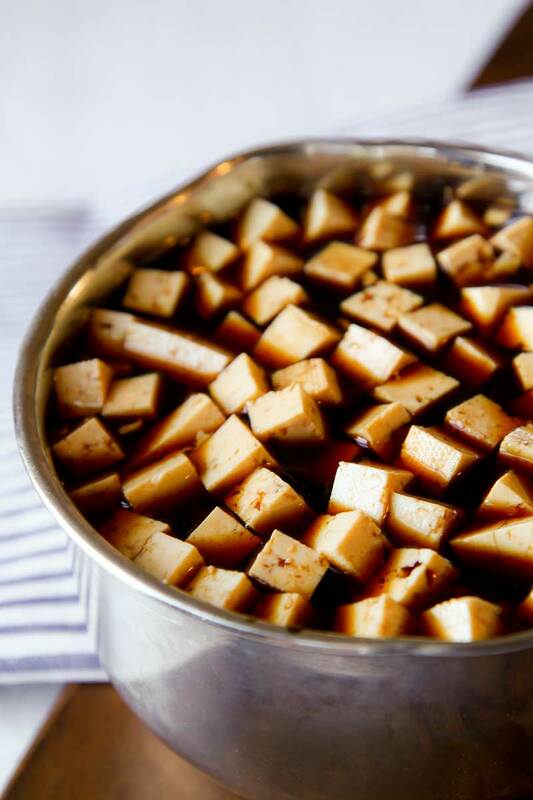 Now, cut the tofu into dices large ¼ inch, and marinate them 30 mins into the soy sauce. 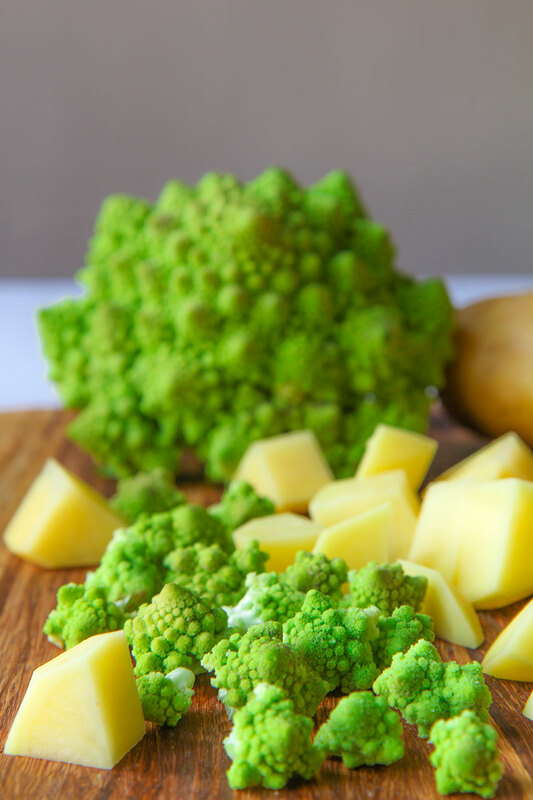 Finally, divide the Romanesco broccoli into little stems.